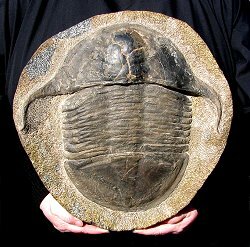 Size: Trilobite is almost 13" long, almost 13" wide! This is a very large fossil trilobite. It is a HUGE Asaphellus stubbsi from Morocco. This specimen was recently acquired from the Richard Busch Collection. Busch was the Preparator/Asst. Curator at the North Museum in Lancaster, PA from 1965-1992. This trilobite was nicknamed the "moustache bug" because the genal spines on the sides sort of look like a handlebar moustache. The trilobite is nicely prone, very inflated, and has nice, dark brown shell (skin) preserved. The trilobite is well displayed on the light-colored limestone block. And at almost 13 inches long, it is a very large trilobite, to say the least. This is a very impressive example of one of the more distinct trilobites from Morocco.